This is part 2 of a 2-part guest post from Todd Broderick. Check out Part 1: Essential Tips for a Great Trip to Wine Country. Run by the Jim and Anita Forchini. The wines are fantastic; the tasting room is attached to their home on the vineyard property. They have some really interesting red blends and it is always cool to talk to the people who make the stuff not just sell it! Call ahead. Now, I know you are thinking, come on – everybody knows Silver Oak, why would I want to go there. I’ve got 2 reasons; 1) A great tour, that doesn’t make you feel like an idiot for being a novice and 2) Unbelievable cabernet, they are usually pouring current release and something from the library that you likely wouldn’t find by the glass anywhere. Call ahead. Run by the owner, Steve and his staff. They do barrel tastings on a regular basis, for a moderate fee you can try some interesting wines, tasting room is nice, good views. . .a little boring, but damn good wine. The pre-release purchases I made arrived in April this year were exceptional. Try the petite syrah and the zinfandel. There are always some very good and interesting wines you will only find in the tasting room. The staff has never been particularly engaging and there are no tours, but do the tasting and take a walk around outside, the vineyards is beautiful. To sum it up great wines and amazing scenery. The gnarly old zin vines and the afternoon sun are a thought that always makes me smile. Right down the road from Ridge, not exactly what I would call a terribly impressive facility, but they don’t need one, the wine speaks for itself. Simply put, the wine was awesome and the tasting room staff was great. I made it there in the fall of 07 the first time, and tried the first vintages from their new winemaker, and have found consistently great wines very time. So with that, I wish you luck in your travels and encourage you to explore, talk to people and taste something new. When you get back, email me your favorite! 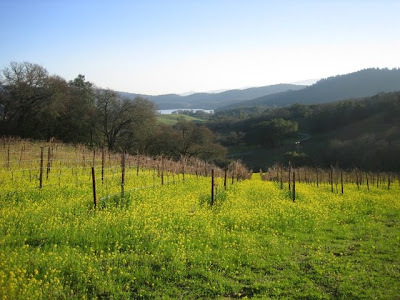 Question of the Day: What are some of your favorite wineries in Sonoma? We'd love to hear about them.